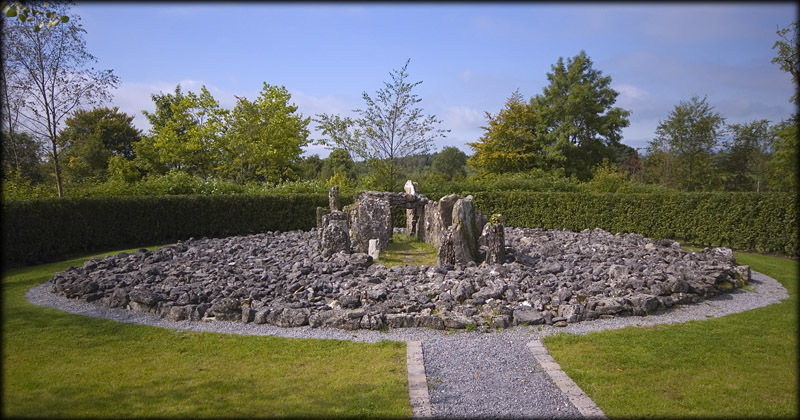 Located in the Grounds of the Slieve Russell Hotel, this fine wedge tomb was originally located on the slopes of Slieve Rushen in the townland of Aughrim. The Quinn Group were quarrying on the mountain and rather than destroy the monument, which dates to c.2000 BC, it was excavated in 1992 and reconstructed on the grounds of the Quinn groups hotel and now acts as a tourist attraction. The image above was taken from the eastern side of the tomb and the image on the left is from the west looking at the entrance. 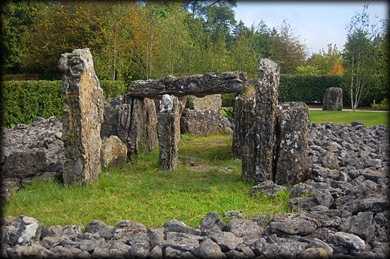 The Wedge tomb, which is circular in appearance consists of a circular kerbed cairn with a long 5 metre gallery at the centre. The entrance to the gallery is split and has a portico. The side walls of the gallery are buttressed with several stones at right angles to the walls. 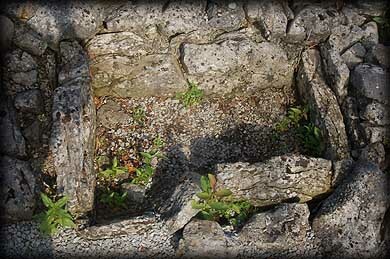 There are three small cist graves, example shown below, built into the cairn which were probably added at a later date. Although the location of this fine monument is not ideal and appears a bit sterile, at least we know it has been saved from destruction, a fate that is happening to many of our prehistoric monuments at such an alarming rate. Situated: On the grounds of the Slieve Russell Hotel, Ballyconnell, County Cavan. As you enter the grounds the tomb is in a small hedged enclosure to the right of the main building. Discovery Map 27: H 288 166 Last visit August 2007.